Trekking has always been probably the major attraction of the Cinque Terre : the trail net is large and well designed for all kinds of trekkers, from the most expert ones to the beginners who just want to get a quiet stroll to get the view. In each one of the towns the tourist point will be happy to give you detailed informations and maps of the trails. Cinque Terre feature a world known trail network that will lead you in the most enchanting corners of the area. All the trails are in excellent conditions and mostly for everyone, not only for climbers. The trail network link all the five towns and more, letting you to visit also the town outside the national Park, like Levanto or Portovenere. The blue trail (Sentiero Azzurro, connecting the whole five towns) is still possible to walk : even if Via dell'Amore is still closed, you can walk on the alternatives that according to many are even better than the coastal classic ones. 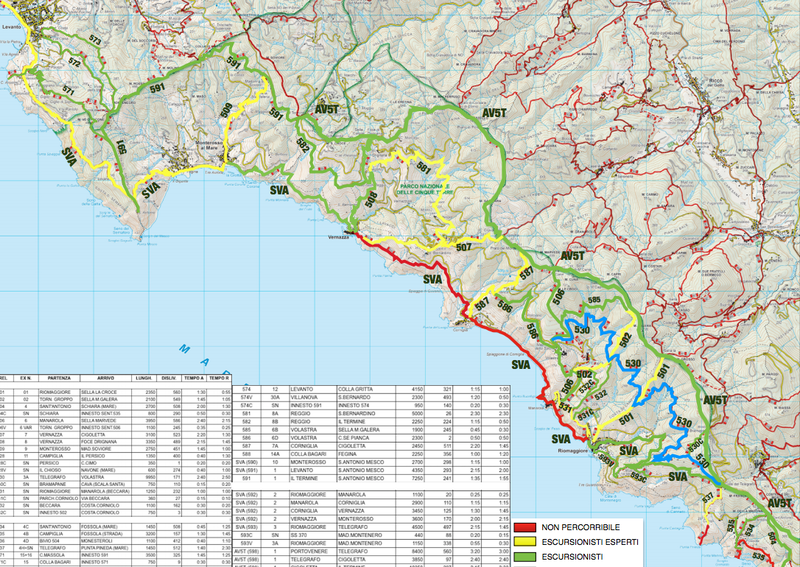 The only two closed trails are the SVA (RED) Manarola - Corniglia via coast (the alternative is 586 GREEN, the mountain one from Volastra to Corniglia) and the SVA (RED) Via Dell'Amore (the alternative is the 531C YELLOW, Beccara trail, from Manarola to Riomaggiore).